They take some getting used to and it’s important to get the wires positioned correctly, the earphones go into the ear canal and the wires then loop up behind the ear. They then join into a plug. That section is only about 6 inches long, so unless you have an MP3 player that sits on your shoulder, you have to plug it into the supplied extension cable. They also come in a nice impact resistant nylon case which fit the phones and the extension lead. You could also squeeze some extra flanges in too. Once installed (and the ear-phones do practically install in the ear) suddenly the outside world disappears and becomes very muffled. This isn’t always a good thing – they wouldn’t be sensible to use while driving or other instances when being able to hear what’s going on in the immediate vicinity is important. Using them on the Tube is a boon, the commute becomes a world unto yourself – no noisy commuters just audio coming from inside your head! That is slightly weird, while listening to music it comes from somewhere between your ears, stereo effects become very pronounced too. Tube announcements do seem to make there way through, just loud enough to hear the announcement, but quiet enough to ignore if you want. Most people have the volume of their earphones/ headphones turned-up way too loud, this a) annoys other people who can hear the high frequencies zing out and b) is likely to damage your ears. 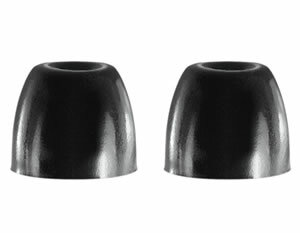 The in-ear design means that the volume should be turned down to a very low level. As well as saving your ears, the drivers are no where near the points where they distort and the sound is very crisp and clear. You hear what you’re listening too. All very pleasant. As an example on a MacBook Pro using the SE310’s to listen to Spotify setting the volume above 2 (out of 10) meant that music was pretty loud and system beeps didn’t hurt. The clarity of music is superb, the phones are very accurate in reproducing what’s been listened to (unfortunately that also means noise and other artifacts are also faithfully reproduced). normal earphones supplied with MP3 players and such like. The RRP is £169 but they’re available from around £105 on the Internet. That’s a lot of money to spend on a pair of earphones, but the quality is great and they may save your ears from damage in later life. 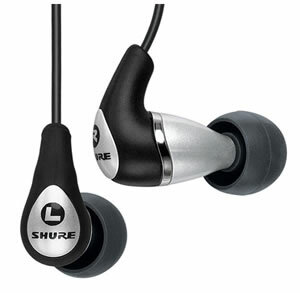 They’re at the middle of Shure’s range and the price reflects that. They also come in black or white (designed for Apple’s original iPods), which is probably slightly outdated now for the modern splurge of rainbow colours that MP3 players come in. Earphones are great quality, allows listening on low volume which produces really clear sounds. Reasonable bass and treble response. Better than any supplied MP3 earphones. Need to use the extension cable (so why make it an extension in the first place), they cost a lot. If anything the sound is slightly bright. Score: 81% but there’s competition in the market at this level. very good review , but I have a doubt, once you put it in your ear if it can’t be removed away , what to be done .